We look forward to talking to you in person about the best puppy for your home, keeping in mind your desires with respect to gender, coat, size, and color. (For more information on our selection and reservation process, please see "Conditions of Puppy Reservation" below). Please fill out the electronic application below to indicate your preferences. Upon acceptance of your application, a $500 application fee will be required, which is refundable under some conditions/or may be applied to a future litter. Beginning in July 2017, all our puppies are $3,000.00 (plus 8.75% sales tax for California residents). We accept personal checks, cash, and Paypal payments for reservation fees. The balance of the payment will be due when the puppy is 6 weeks of age. We prefer NOT to ship young puppies, but can usually offer hand-delivery of your pup to you at cost of travel plus vet's medical certificate and airline-approved crate. We are happy to answer your questions before and after you have purchased one of our puppies for as long as you own him or her. We look forward to hearing from you about your new family member’s progress and always welcome photos. This information about your puppy as he matures is invaluable to us in developing our breeding program going forward. We strive to meet our Puppy Families' desires in terms of their ideal puppy, although we believe that temperament and personality should be the primary factors in permanent home placement. We screen all of our puppies over a period of many weeks to determine suitability in different home situations, and, as we want our Puppy Families to be happy with the puppy they are adopting, we will work with you personally on selection. Besides temperament--and we do focus on consistency in temperament in our program--gender, size, and color are other selection factors. It has been documented by breeders that there is little difference in temperament between males and females which are neutered or spayed at 8 weeks. Ultimate adult size can only be estimated by the size of the parent dogs, but may not be apparent until much later, and, with hybrid dogs, size within a litter can vary greatly and can not be guaranteed with better than "ballpark" accuracy. 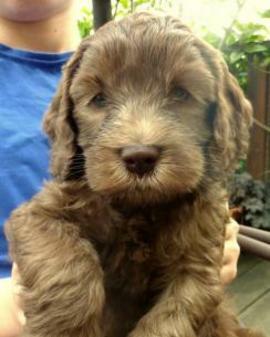 Puppies are almost always born much darker than they will end up as adults. 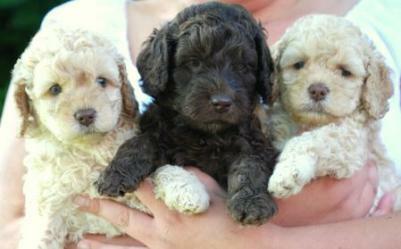 "Chocolate" pups for example are likely to end up as "Cafe" (like "Cosmo" and "Bibi") or "Parchment" (like "Lily"). Apricot-cream pups are likely to end up "Cream". When the puppies are born, we will know color and gender availability and will contact families regarding the availability of their selection. Flexibility on any/all of the three selection factors greatly improves the likelihood of there being a puppy for your family! ​We require a $500 deposit which is completely refundable if there is no puppy born and available that has the one PRIMARY "Most Important trait" of your desired gender or color traits on the original application. For example, if you will only accept a male, and none is born, (or if we are considering withholding it for our breeding program), we will refund your deposit in whole, or roll it over until the next litter, if you desire. If a family declines a puppy that does have their "primary" desired trait (gender, estimated size, or color) or declines a puppy within 3 weeks of the go-home date, the deposit will be transferable to the next litter. If there is no other litter being whelped within the subsequent 90 days, the deposit will be refunded in full. All this being said, we are happy to work with you to satisfy your ideals! The application below will help us select the best puppy for your home. So that we can best assess your desires, we welcome your phone call...after you submit the application. Be sure to include your telephone numbers in your application. If you have not heard from us in 48 hours, please email or call us directly at (650) 576-9068, in case of email problems. Please state clearly if you are unwilling to accept a puppy of a different gender and color than you indicate on your application. I will do a final assessment on temperament and conformation at 7 1/2 to 8 weeks, which is the age at which both of these factors are most effectively evaluated. 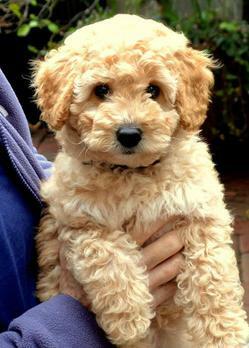 If there is a puppy that I choose for the breeding program, that is when I will decide. At that point, I will allocate the remaining puppies to families on the waiting list based on: 1. temperament and 2. the other characteristics (gender, size, color). In the case of multiple comparable puppies, the families who have submitted their deposits first will be asked to select their first choice of the litter. Payment in full is required by check if one week before pickup date or in cash or cashier's check when puppy is picked up. The puppies will be spayed and neutered, microchipped, given a medical examination, and then made available to their new owners between 8-9 weeks of age. If the family is unavailable to take possession of their puppy immediately, I will board him or her if I am available for a small fee. We want you to follow the development of your puppy's litter each week as they grow and learn, and always post regular updates and photos on the "Puppy Photo Blog" after they are born. We have a planned playdate at 5-6 weeks of age so that you can visit all of the puppies and usually mom too, depending on the mom's feelings. Please describe your past experience as a dog owner. Do you have another dog at present? Do you have a home with a fully-enclosed yard? If not, how do you plan to confine your dog? Which best describes your lifestyle? Please describe how the dog will be looked after during the day. Is there someone at home for most of the day? How many hours a day would the dog be left alone? Are there any elderly or disabled people in the home? Are there any people in the home with dog allergies? Are you willing to take the puppy to obedience training? Use an in-home trainer? Will you feed your dog a high-quality diet (not "grocery store" dog food)? We will guarantee that there will be a puppy with ONE of the "Most Important" traits or refund your deposit. We will try our best to satisfy your "Second Most Important" trait! And now get ready for an amazing addition to your family...!